I was recently reminded how hard we try to be accepted by society. I also know personally that it can, if you allow it, take control of your life in a manner that is not healthy. 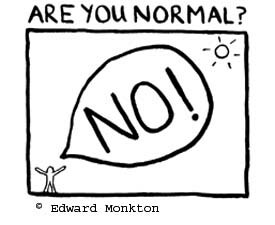 It seems to be most people’s aim in life to be ‘normal’, but I am not sure that many of us truly understand what ‘normal’ really is. If, for the purpose of these musings, we assume that normality is that which enables us to fit in with our peers, then the Holy Grail of normality must be the one thing that ties all of humanity together. A quick bit of research tells us that just under 50% of the population are female, 85.7% are White British and 71.6% class themselves as Christian. Two eyes are more than the average number and hair colour is too vague to be universal. About 1.7% of children have Aspergers, nearly 64% of the adult population have a driving licence and around 20% of British adults struggle to read. The more I try to think of something that ties all of us together, the more I struggle! I tried to be smart and say we all have blood in our bodies, but even the blood has different types, and don’t get me started on DNA and finger prints! The one thing I am certain of that covers all the people in the world is this one truth – God loves us. It does not matter who you are, where you are, or what you look like. It does not matter whether you can drive, have a disability or have green hair. God loves you! Fact! Whilst there appears to be ‘fifty shades of normality’, that one truth throws a big arm around the whole of humanity and makes us all normal. And when we accept this one heavenly example of normality, we will then be truly free to celebrate our individuality. I am finally normal then. Brilliant. Thanks matey. Thanks dean! I can’t take credit for this one – my mate Stuart’s work!! I agree that we spend too much time trying to fit in when we already have a place we belong. Yet to all who received him, to those who believed in his name, he gave the right to become children of God— children born not of natural descent,[c] nor of human decision or a husband’s will, but born of God. We are children of God and belong to His family. Regardless of what our earthly family is like, we have a heavenly family we belong to and a Heavenly Father that loves us unconditionally. There are so many things that separate us and divide us in the world today – trying to be “normal” may be one way we try to find something in common with others. However, we have something else in common, as believers, that crosses all nationalities – a citizenship that is in heaven! True – so true. He loves everyone to the nth degree. He is not willing that any should perish and made the way possible that this should not be. It is also a fact, however, that everyone is a sinner and that sin separates a person from God. The love of God can only be fully realised when that separation is closed by the blood of Christ. there will be NO WAY to ESCAPE the WRATH of God!